Our Old Miners Cottage: Our frogs are dying. Over the past week or so, we've been excited to see some froggy friends in our very own backyard. We've rushed to grab the camera, take some close-up photos, only to find that they are not breathing, not blinking, and not trying to hop away from the camera. Sadly they've all been dead or very near death. Today my Mum and little brother (10) were visiting, and my little brother excitedly told us he found a frog. We went over and found that a frog had hopped its way up to the garage area, and was sitting very still. Sadly the frog was dead. I explained that this isn't the first frog we've found like this, especially in the last week or so. It may be a co-incidence, but these last few weeks have also seen a huge spraying effort undertaken by the council and the elderly neighbouring landholder. All the grass areas around Our Old Cottage is dead (we're a little haven of green at the moment). This last week or so has also seen quite some heavy rain, too, which has filled our little "pond" again. Being a low point, we get the run-off from neighbouring properties.. with anything that they're spraying settling in our "pond", too. We've contacted the council several times about the glyphosate / Roundup and whatever else they might be spraying around. Unfortunately, they are not about to change their policies regarding blanket spraying. They spray their land, and in their stormwater drain, which goes to a storage dam which is then used to water the sporting grounds. Their argument that it's an accepted form of weed control does nothing to ease my mind about the damage they're causing the frogs and the land. Marty and I are both really sad about the frogs, and angry at the council and landholders who feel they have no choice than to spray. My Mum and little brother were nearly in tears about this froggy, and we feel absolute frustration that we can do nothing to change the situation. After all, Roundup is suppose to be "safe" and it's legal to spray when and where they like on their respective properties. I am devastated for you. Frogs are so highly sensitive to poisons and we have seen a real reduction in their numbers by irresponsible spraying like this. 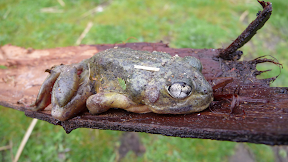 Can you get hold of your parks and wildlife or google frog preservation activists and see if you can get some support to overcome this slaughter? Take photos with time and dates of when spraying occurred and the subsequent deaths. Poor froggies, if they sprayed where it doesn't enter the water it might be controlled better, but drift will occur. Thanks Cosmic. I've kept an informal diary of the councils spraying, but I didn't record each frog. It honestly didn't click until yesterday when my brother found the latest frog. We thought it was coincidence or bad luck before then.. but about 4 frogs in a few weeks is a bit more than coincidence now. I'll keep records from now on. We both can't understand why the council and landholders don't just slash or mow their grass, when we're able to look after our yard with nothing more than a sythe, and a person-powered push-mower. I maintain that I can see a use for chemical herbicides in certain circumstances - painting some on a cut trunk of certain weeds, spot spraying in the right weather conditions maybe.. but blanket spraying in any weather (even rain or shortly before rain) is just outrageous. We'll contact our local Landcare group on Monday and talk to them about what could be done as well. Thanks again Cosmic. That's devastating. I hope you can get something done about it. That's very sad, frogs are such a barometer of pollution levels. Cosmic is right, there must be some organisation who would take an interest. I don't believe that anything that causes so much devastation can be harmless, can't help feeling we would be alot better off without roundup and the like.